MnDOT began using design-build in 1996 and constructed three projects using a low-bid approach. In 2001, MnDOT obtained legislative approval to use the design-build best value procurement process. Since 2001, MnDOT has awarded over $1 billion in design-build projects. Design-build is a contracting process that brings designers and contractors together early in the detail design portion of a project. The owner clearly defines the standards and general specifications they expect for a project, and the design-build team works together to satisfy those requirements. MnDOT uses the flexibility design-build offers to maximize the value received per dollar spent in a variety of situations. Read more about the program. 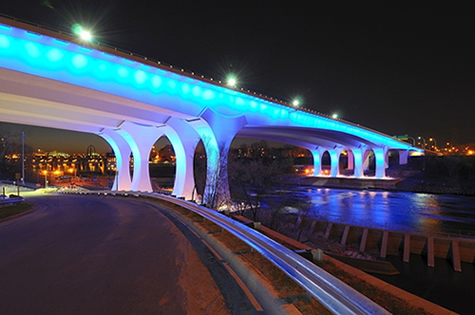 The I-35W St. Anthony Falls Bridge in Mpls was built using a design-build approach.